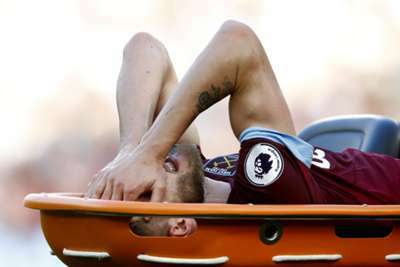 West Ham star Andriy Yarmolenko is set for six months on the sidelines after undergoing surgery on a damaged Achilles tendon. The Ukraine international, who signed from Borussia Dortmund in July, suffered the injury in Saturday's 1-0 Premier League derby defeat to Tottenham and had an operation on Monday. Yarmolenko has scored two goals in the league for West Ham this season, having also sustained an Achilles injury last term with Dortmund. With the Hammers confirming an expected six-month lay-off, head of medical services Richard Collinge said: "Andriy's operation went well and we will now work hard to support him throughout the rehabilitation process. "His recovery will be planned very carefully and we have every confidence that he will return to full fitness within the scheduled timeframe."